Dr Yair Huri is a lecturer in the Department of Middle East Studies at Ben-Gurion University of the Negev, Israel. He is the author of numerous scholarly articles on modern Arabic Poetry and Arab Literary Criticism & Linguistics. Sa’di Yusuf has long been acknowledged as Iraq’s foremost living poet and one of the preeminent modernists of Arabic poetry. In this first book-length study in English on the subject, the author seeks to provide a comprehensive look at Yusuf’s literary accomplishments through thematic analysis and close readings that place his texts within wider literary contexts. Encompassing discussions of more than a hundred poems, this study offers a coherent framework for understanding the body of work created by a major poet of our time. Ever since I began reading Sa’di Yusuf he has become the one who appealed the most to my poetic taste. He is one of our greatest poets. Poetry led him – or rather he led poetry – to revolt against the transcendence of poetic language and in its stead to create a new language: one characterized by austerity and its core by the search for essence. In this way poetry in his poems becomes life itself – life in all its fullness and spontaneity. Dr. Huri has created a book that will undoubtedly succeed in introducing Sa’di Yusuf, one of the most prominent Arab poets of modern history, to the Western world. He offers a truly comprehensive reading of Yusuf's entire body of poetry and does so with intelligence, thoroughness, skill and enthusiasm. 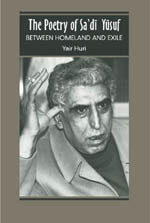 The monograph deftly weaves together aspects of Yusuf’s tumultuous biography with his achievements as a poet of the highest order, while focusing on Yusuf’s persistent themes: the artist’s perennial search for poetic and personal identities, the poet’s role in society, the power of poetry as fortification against the onslaught of time and much more. This deeply informed, highly readable study is a cogent and thoughtful contribution to our understanding of contemporary Arabic poetry and Iraqi poetry in exile. Sa’di Yusuf is one of the most prominent poets of modern Iraq, a country that has produced some of the greatest Arab poets, past and present. Yusuf’s poetry is highly individual and distinctly original in its language and imagery. Grounded in scrupulous and impeccable scholarship, Yair Huri’s excellent monograph is the first attempt to discuss the life and works of Sa’di Yusuf in their entirety. It is extremely impressive in being based on profound and erudite familiarity with literary theory and, at the same time, accessible to the general reader. In this intellectually rewarding volume of literary criticism, Yair Huri introduces most effectively the poetry of Sa’idi Yusuf, an Iraqi and justly renowned poet. Although Sa’idi Yusuf is an Iraqi/Arab poet, his work of poetry knows no boundaries as it plausibly displays humanistic values and universal trends of feelings and ideas. Hence the prevailing proclivities of the poetry by Sa’idi Yusuf, makes it remarkably worthy for literary criticism that is fed and conditioned by aesthetic-artistic considerations and ideological perspectives. The poetry of Sa’idi Yusuf also exhibits some political tendencies. Huri’s close and careful readings of 100 of Yusuf’s poems display an impressive knowledge of the work, illuminating the poems’ aesthetic sources as well as the intricacies of their structure. He has given us an excellent introductory study on one of the most important modern Arab poets.